Like many of you, I drive a Toyota Camry. It is probably the most common car on the road today, and most of us who have them like them very much. Most of us who have them also feel that as drivers of the most common car on the road today we are each of us about as unique and individual as a painting by Thomas Kinkade. Now not only do I drive a Camry, I drive what has to be one of the most popular models of Camry ever: a late model dark gray Camry LE. Just go out riding and look for one of these and if it takes you more than three minutes to spot one you are never going to be on my team in a treasure hunt, of that you can be sure! It occurred to me recently that perhaps someone might develop a trend or a meme in our very culture to make we Camry drivers feel a little more special. What if there were an implicit understanding that all Camry drivers would hale one another whenever encountering a brother or sister? This would create a immediate bond, providing Camry owners with the sense of belonging to a very special private club of middle income folks with limited style and very limited cool. We would be just like the freemasons, only without the secret plan to take over the world. So I set out yesterday to begin reshaping the very culture of the United States as we know it, just after whizzing, zipping up, and heading out of the can. I wasn't driving very long before there came from the opposite direction ... yes, indeed it was ... a late model dark gray Camry LE! I honked my horn. I waved enthusiastically. I waved vigorously. I waved as if I were waving to Granny Clampett from the Beverly Hillbillies. And I got the driver's attention! He rolled down his window. What's that he was saying? "I'm a mother ... what?" I should eat your ....what? I'm a piece of .... hey, I heard that!" Seems I may have mis-communicated. My fellow Camry driver somehow thought I was either critiquing his driving or commenting on how his mother came to be the talk of the Eighth Fleet during the Korean War. Turning into the mall, I spotted yet another late model dark gray Camry LE with a distinguished looking gentleman at the helm. This time I chose a more graceful approach with a soft thumbs up and a bright smile. And the gentlemen indeed saw me and promptly rolled down his window. "My place is just a half a mile down the road," he said. "Meet you there in ten minutes." Gee, I wondered "wouldn't a gay guy have picked a brighter color than dark gray? I wonder if he's since rethought that?" Well, on to one more. "Hello, Miss! We have much in common, do we not?" "Yes, we do, brother," she shouted, "we have 250 years of capitalist exploitation in common! Free everybody everywhere!" Odd. She hadn't affixed the requisite 500 bumper stickers to the back of her Camry with everything from Don't Eat Grapes to Ask Me About My Grandchildren Who Are Socialist Revolutionaries. I guess even she realized a late model dark gray Camry LE just wouldn't support all that revolutionary fervour. And so, three up, three down. I had failed to create a cultural meme. Nobody was interested in the idea of a special club for drivers of an unspecial but highly efficient and very pleasing automobile. I guess Camry drivers are quite secure in their own middle-of-the-road middle-of the-roadness after all. And I guess I am too. But I'm still feelin' the love, brothers and sisters. 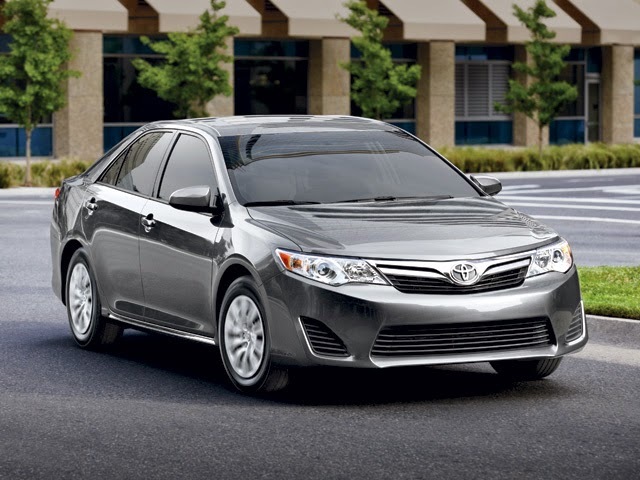 You just can't beat Camry Camaraderie! How many do you try to get into in a parking lot before you find yours? Sometimes I even actually get into one or two, which kinda upsets the guy already sitting there. Thanks, Patti!